The Hickmotts in Australia descend from the family group that lived in and around the rural village of Lamberhurst in the County of Kent in England. The name itself, plus such variations as Hickmote, Hickmot and Hitchmough, is said to date back to the fifteenth century and is thought by some to mean the brother-in-law of Hicks. Some believe that the name originated in either Germany or France and came to England at the time of the Norman conquest. However it arose, the name remained largely restricted to the counties of Kent and Sussex in the south of England. The first forebear we can be reasonably certain about was Thomas Hickmott (1651-c1714) a yeoman farmer who owned land and properties, totalling in excess of 143 acres, across the parishes of Lamberhurst and Horsemonden. On his death, Thomas' land was divided among his wife Mary Masters and sons Thomas, Leonard and John Hickmott (1684-1750). John and his wife Ann Russell (1697-1754) were living at Horsemonden at the time but in 1722 moved to Lamberhurst where they remained for the rest of their lives. The couple had at least twelve children whose descendants have been traced to such places as Cranbrook, Frant, Rotherfield and Wadhurst in England, as well as to Australia, New Zealand, Canada and the United States. Among the latter were James Boorman (1806-1899) and his wife Jane Beaumont Watts (1813-1886) and their three children Mercy, William and Thomas, who all emigrated to Australia in 1841, and James' nephew David Doust (1836-1886) and his wife Mary Waters (1837-1909) who arrived in NSW in 1851. These two families have been researched by Nigel Masters and others whose websites are listed on the useful links page. Click here to read a brief account of their lives plus those of some of John and Ann Hickmott's other descendants. Our line of the family descended from Thomas' great great grandson Thomas Hickmott (1769-1854) who married Elizabeth Wibley (1766-1837) at Lamberhurst on 2 May 1788. Like his namesake, Thomas had twelve children including two sons, Thomas and Samuel, who were transported to Australia in 1840. Samuel' s youngest son, Henry Hickmott, and his wife Sophia Goldsmith and two daughters also came to Australia (in 1849 as assisted immigrants) where they established a large and continuing family. Thomas and Elizabeth's other known children were: Susannah (1788-1805), Edward (1790-), Thomas (1791-1794), Mary (1794-), William (1796-1860), John (1797-), Elizabeth (1801-), Charles (1802-), Harriet (1805-) and Sarah Ann (1807-). Click here to read what we know about Thomas and Samuel's siblings, their families and descendants. The name Lamberhurst derives from the Anglo-Saxon words lambru (lambs) and hyrst (woodlands) and means something like 'a woody place that is suitable for lambing or the pasturage of lambs'. Located some seven miles east of the Royal spa town of Tunbridge Wells, it lies across a tributary of the Medway, the River Teise, which forms the border between the counties of Kent and Sussex. 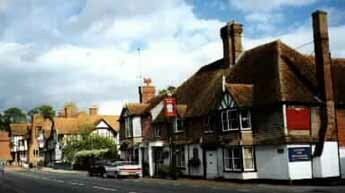 The village sits on the edge of the famous Sussex Weald that was once a great forest of oak and beech trees. During the late Saxon period the area around Lamberhurst was used by the manors of north Kent to graze pigs and other farm animals. These were tended by men from Rochester and other villages who were accorded the right to fell timber and clear pastureland. The driveways and boundary ditches created by these early visitors (which often followed earlier iron age paths) would come to form the area's principal roads and walkways. Little permanent settlement occurred in the area, however, until after the Norman Conquest. From this time travelers used the shallow crossing on the River Teise near the future village of Lamberhurst during their journeys between Hastings and London. The area around the ford became gradually settled and, in the custom of the time, the lord of the home manor built a small wooden church on a hill overlooking the river crossing (and on the site of Lamberhurst's present-day parish church of St Mary). By the late thirteenth century around 100 people were living in the area, their meagre homes accompanied by a much grander dwelling, the summerhus, which housed the lord or his representative during their visits to the area. During this period pastures continued to be cleared, large numbers of sheep were brought into the area, and a thriving woolen industry was established (by the Cogger family from Wadhurst in 1275). A virulent sheep disease, accompanied by a dramatic fall in the price of wool, subsequently saw cattle take the place of sheep as the district's staple produce. This trend was accentuated when the Primate of Robertsbridge Abbey gave permission, in 1314, for the village to hold a weekly market and fair. This ensured that the cattle drovers heading to summer pastures on Romney Marsh made Lamberhurst one of their overnight stopovers. According to Lamberhurst and the Down, a conservation report prepared in 2002 for the Tunbridge Wells Borough Council, and on which much of the above is based, 'the drovers lodged at what is now the Memorial Hall site. This early legacy of cattle industry also established a shambles (slaughter house) which was on the Coggers Cottage site, [and] a substantial stone-built tannery at Tanyard Cottages with another occupying the Tanhouse site'. The construction of two inns at the river crossing also served to accommodate travelers moving to and from the coast. But sheep and wool continued to be grown and, probably because of Lamberhurst's history, were always considered favourably. Thus Lady Hope's popular travelogue, English Homes and Villages: Kent and Sussex, reported in 1909 that the lamberhurst's shepherds continued to be 'recognised with much respect, and their trade vied with vine keeping...another important business'. The shepherds, she continued, were also 'famous for spinning yarns, and would always get a hearing, even though many of their travel stories and historic legends would go back "fifty years agoo" or "perhaps a hundred"'. As industry grew, so the township expanded outwards from the bridge that was first erected over the Teise in around 1070. 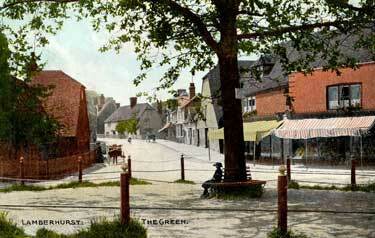 Among the surviving early buildings are Owl House, which is located on the western edge of Lamberhurst, and Hickmott Cottage (shown on the right) which can be seen in High Street near the green. The above mentioned conservation report tells us that the Owl House was built in the 16th century and is so-named 'because of its association with wool smugglers, known in those days as owlers'. The earliest recorded date of the Hickmott Cottage is said to be 1525. 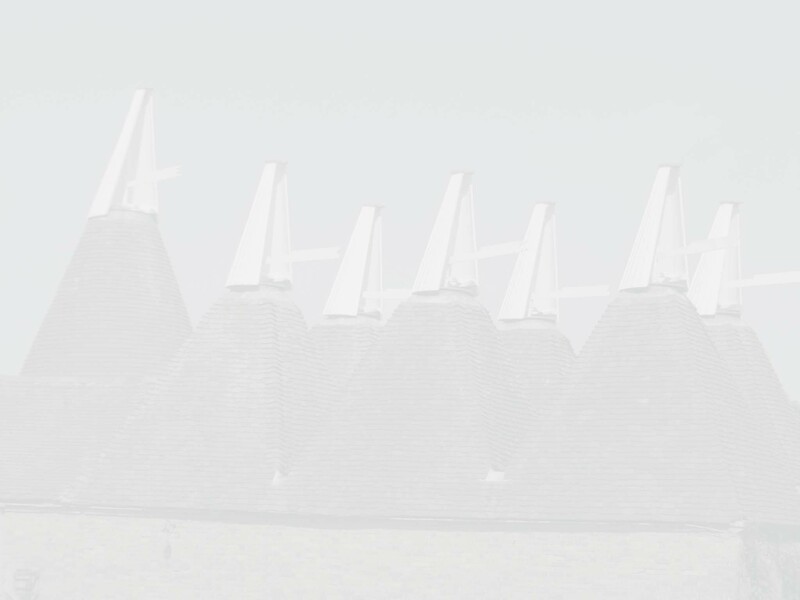 'The gabled portion fronting the road with its sweeping catslide and half hip roof forms a distinctive feature that has "evolved"over the years. The near continuous run of wooden casements on the ground floor is also a unique feature'. The area has also been home to a number of much grander dwellings. 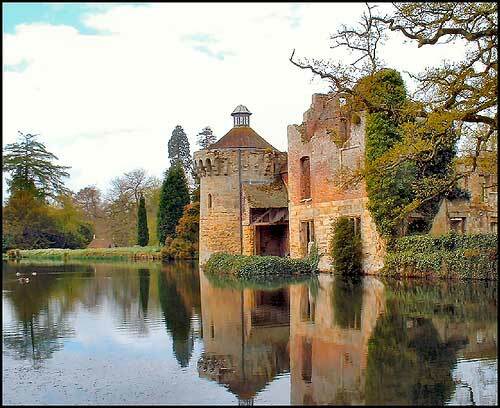 One of these is Scotney Castle. Founded by Lambert de Scoteni in the twelfth century, it was thought originally to be a fortified manor house built to withstand 'sudden attacks of lawless neighbours, or marauders from the coast' (Edward Hussey, 1887). The castle's most conspicuous early owner was probably Walter de Scotney who was tried and hanged at Winchester in 1259 for administering poison to Richard, Earl of Gloucester, and his brother, William de Clare. In 1378 a new owner, Roger de Ashburnham, added a stone quadrangle to the castle so that it could serve as a defence against a feared French invasion. The Ashburnhams sold the castle to Henry Chichley, the then Archbishop of Canterbury, who left it to a niece who had married into the Catholic Darrell family in whose hands the castle remained for some 350 years. A later owner, Edward Hussey recalled that John Darrell sold the castle in 1774 'to one John Richards of Robertsbridge, who was variously described as a dancing master and a quack doctor'. Fours years later the Lamberhurst mounteback resold the castle to Hussey's grandfather, a descendant of Charlemagne, who transformed the medieval Castle from a 'derelict dwelling' to the 'quaint ruin' that forms the basis of what we see today: a round tower and remains of a Tudor house, surrounded by a moat filled in spring and summer with water lilies (see the photo below). Hussey senior also built, in 1837, a new manor house on higher ground but still within sight of the castle. Closer to the village is Lamberhurst manor which was originally held by the Norman family of Crevecoeur. Subsequent owners included Nicholas de Kenith who, during the reign of King John, granted the manor and its surrounding lands to Robertsbridge Abbey. 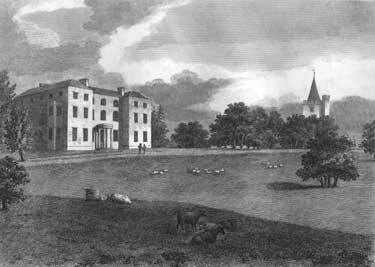 The manor's owner following the Reformation was Sir Henry Sydney who sold it, in 1607, to John Porter (who built the original Court Lodge - pictured on the left in 1809 - as his family residence). By the reign of George I the manor had been acquired by William Morland Esquire whose descendants continue to occupy the estate. 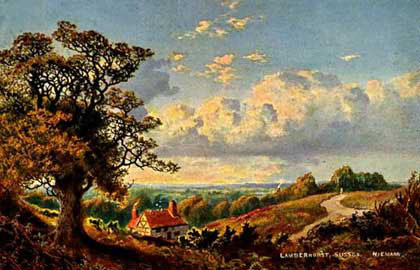 Between the 16th and 18th centuries Lamberhurst also became an important centre for iron working. Gloucester Furnace, located some two miles beyond Bayham Abbey to the west of Lamberhurst Down, was for a time one of the largest iron foundries in the Kingdom. Built by a Mr Benge, it was named in honour of the young Duke of Gloucester following a visit to the furnace in 1697 by he and Queen Anne. The forge initially specialised in the production of cannon and other ordnance, some of which was illegally exported to the continent. Later on it produced such domestic items as skillets and firebacks. It is perhaps best known for supplying the iron balustrades for Christopher Wren's new St Paul's Cathedral for the then substantial sum of �11,202. 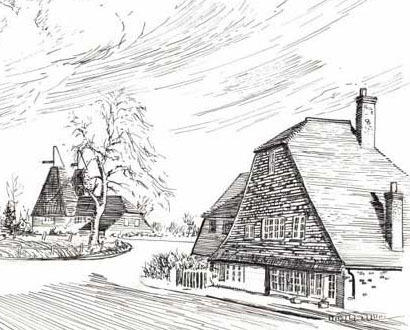 Unlike their competitors in Wales and the Midlands, Lamberhurst's furnaces were wood-fired. They also made use of local iron-stone (or caprolite) which, as the UK censuses show, were mined by many generations of Hickmotts and their neighbours from Lamberhurst and its surrounds. With the advent of the Industrial Revolution, and as coal extraction became cheaper and more automated, the furnaces at Lamberhurst became less competitive and the local iron industry declined (the Glouster Furnace was closed down sometime in the 1780s). Although iron-making predominated during this time, other industries also flourished including: cider and beer brewing (at such places as the Star Brewery, later Smith & Co, located at Stair House), leather making and, as befitted the area's location and history, farming (of largely tenanted farms). Those who were unable to find work were employed by the local squires on such community projects as land drainage and woodland clearing and grubbing. Parishioners who were ill or unable to work were afforded support from the local parish relief scheme or were lodged in the local workhouse. This was located in Wealden Hall which had been left to the parish in 1684 and operated as the village poorhouse between 1740 and 1837 (after which Lamberhurst's paupers were sent to the newly-built Ticehurst Union workhouse). A village school (known as the Lamberhurst national school) was established in 1836 by Robert Hawkins using money obtained from both the parish and the 'National Society for Promoting the Education of the Poor in Accordance with the Principles of the Established Church'. At the time the school had as its master and mistress a Samuel and Sarah Ann Beslee (or Beasley) who lived in part of the Poor House and had their normal salaries supplemented by weekly payments of 3d, 2d or 1d by the childrens' parents. According to Pigot's 1840 Directory there were two other, private, schools in the village at the time: a day school run by a Thomas Thorp, and a gentleman's boarding school run by John Cramp. The same tome showed that Lamberhurst also contained no less than five public houses: Chequers (which is still there today and is pictured in the second photo from the top of the page), the Elephant's Head, the George and Dragon, the Horse and Groom and the Swan. Lamberhurst and the Down, Conservation Areas Appraisal prepared for the Tunbridge Wells Borough Council (2002). The Weald of Kent, Surrey and Sussex Website and documents, paintings and photographs cited therein.